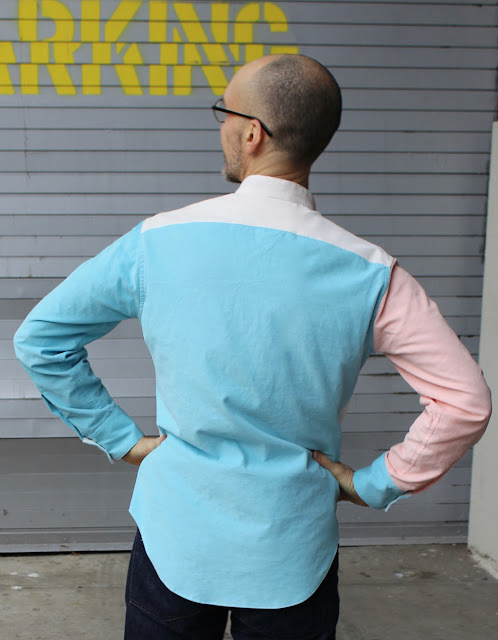 male pattern boldness: The Completed Color-blocked Corduroy Shirt! As you may recall, my corduroy was provided free by the online fabric store Organic Cotton Plus in exchange for a project post. I chose peach, aqua, and cream (red too, but I decided not to use it). 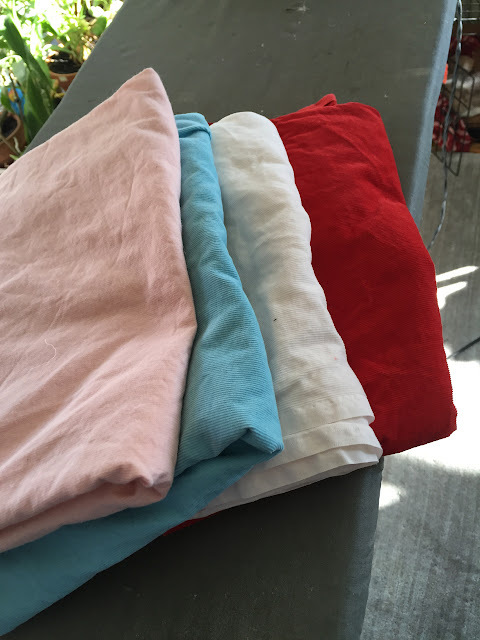 Honestly, to me they look like pink, baby blue, and off-white. 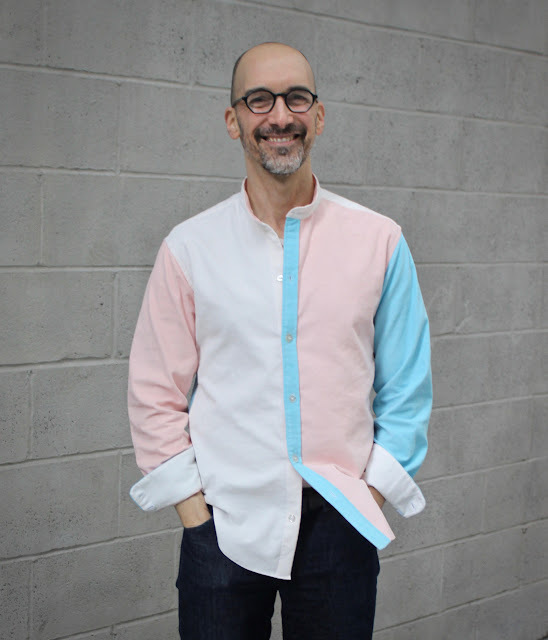 As I mentioned in my last post, my shirt was inspired by the color-blocked corduroy shirts I remember being popular a few decades ago. Those tended to be oversized and done almost exclusively in jewel tones. I think mine, which has a slim fit and a summery palette, feels more contemporary. Speaking of palettes, a few my Instagram followers reminded me that these very same colors are included in Pantone's Spring 2016 color report, only what I call pink, they call rose quartz and what I call baby blue, they call -- are you sitting down? -- limpet shell. I didn't even know what a limpet shell was until I looked it up, but then I'm a city kid. 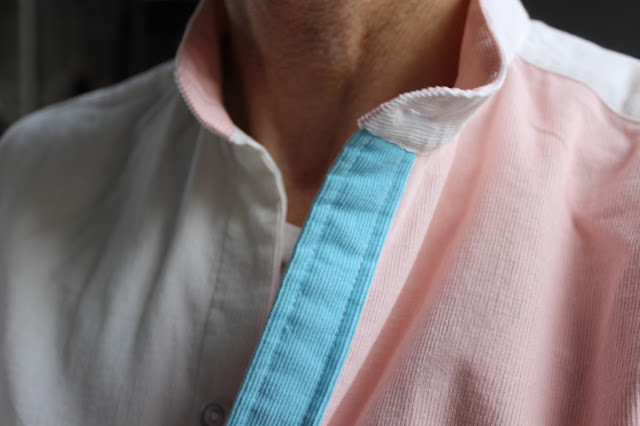 Anyway, the shirt came together beautifully; the cotton corduroy laundered well and was very easy to sew with. Please note that this corduroy is really too lightweight for pants (adult pants that is) but is ideal for a shirt. As you can see, I opted to go with a simple band collar. Both of my inside cuffs are white, while my inside collar band is pink (or peach, or rose quartz). 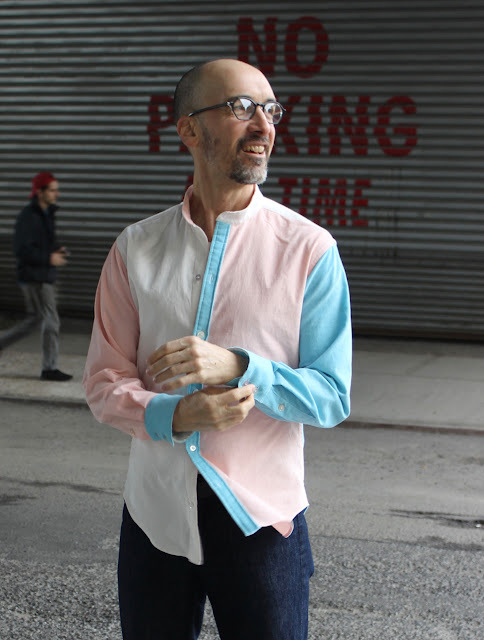 The pattern I used is vintage Seventies Butterick 4575. 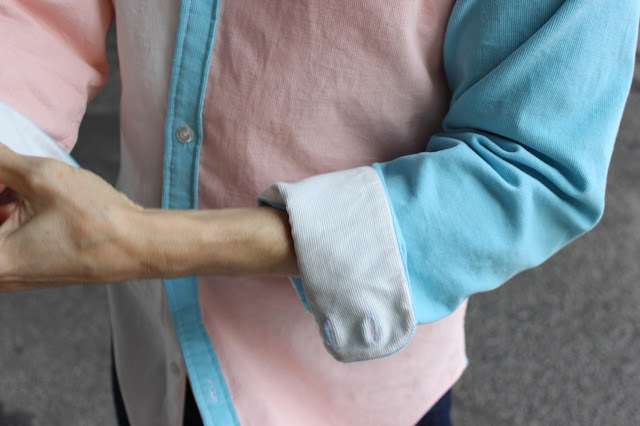 I think color-blocked corduroy shirts are worth reviving, don't you? They're fun. Very well done, as always. You should Google "The Incredible Mr. Limpet." It's a live action/animated movie starring Don Knotts - and yes, he's blue! 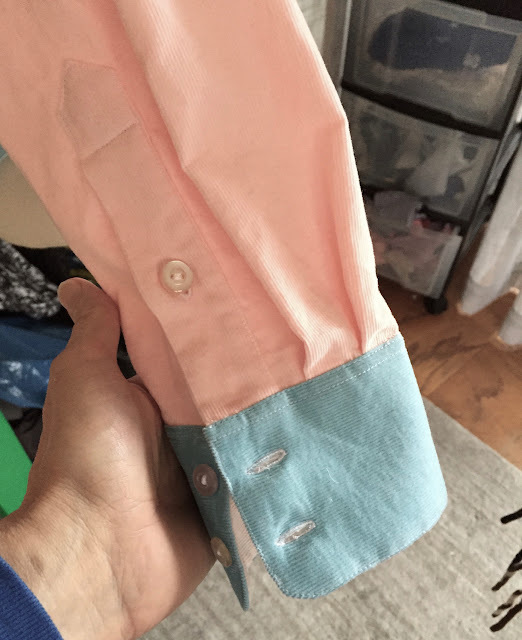 I'm impressed, honestly I thought this would turn out a fail (I wasn't sold on the "normcore" shirts you showed in the previous post, to say the least...). Sorry for thinking that way. Once again, you have totally surprised me with this project. It looks fabulous, and really suits you. I thought it was going to be a bomb. You are confident in your sewing projects, and it leads to success. I wasn't expecting to like this but I love it, now I want one! This is absolutely stunning... I was worried for your reputation when I saw the primary colours one, but wow. This style doesn't resonate with me but you look really good in that shirt! Peter how do you do it? you make norm core cool in that shirt. Love the shirt! Must be something in the air. 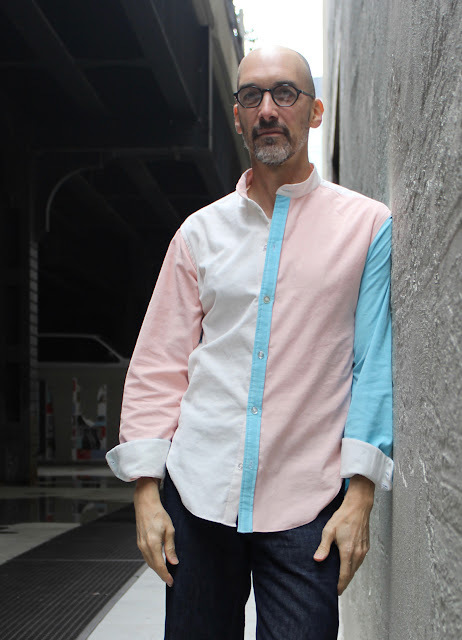 Your shirt looks very close to the pantone colour of the year for 2016: two colours this year, rose quartz and serenity blue. I just jealous because you wear pale colours so well. Love the shirt. Have to admit that I was skeptical when I saw the colors, but what was I thinking? Another winner from someone who appears to never make wadders. Congratulations. Ok, I also withdraw my earlier objections to this shirt... It looks great. 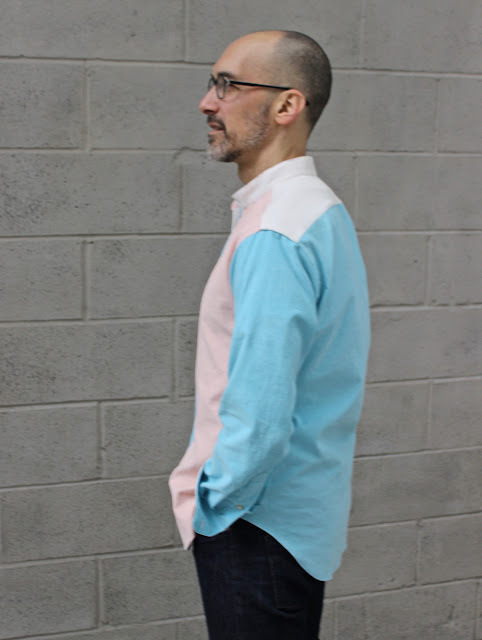 The slim fit, more muted colour palette and lack of pockets really make it work. And by the way, I would not call that baby blue, it really is more aqua than that. I love soft, thin corduroy for shirts. I'm not loving the color blocking, although your craftmanship is as usual, amazing. Floored! That shirt looks so sharp! From concept to completion, you can make anything look great and highly desirable (just you keep your distance from one S. Palin). I like the slightly rick rack look around the collar. How did you do that? Is it serged?? I think that is just the edges of the corduroy peeking out of the seam. It does look a little like rick rack. So now what will you do with the red?? I don't know. I only have a yard. A vest with a Bemberg back? Or what about a "Rustic" style midweight jacket with a dreamy flannel lining and fabulous details and flatfelled seaming? I really like the look of that...color blocking and all. 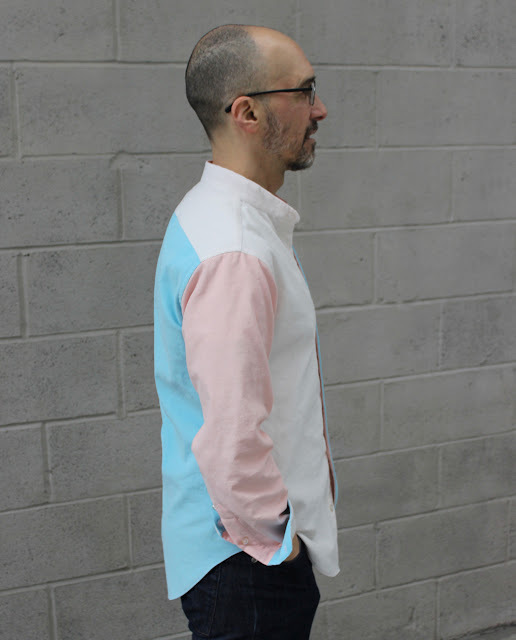 I don't think my guy would wear the pastels though...not a particular fan of them. I wonder how it might look in shades of grey (ok ew...not the movie lol) or different tonal textures of black/charcoal. The cord fabric looks dreamy. I can't help but that for me, cord makes me think of jumpers for my girlie. I think I have one corduroy shirt that I wear when its particularly cold, but other than that I am not particularly drawn to it for myself. Something about the textural issues when it rubs against itself is discomfiting to me. Yeah...color me weird. Gosh..I like it!! The slimmer fit really makes it more attractive and stylish. Not too cold in NYC, eh? Shirt looks great. 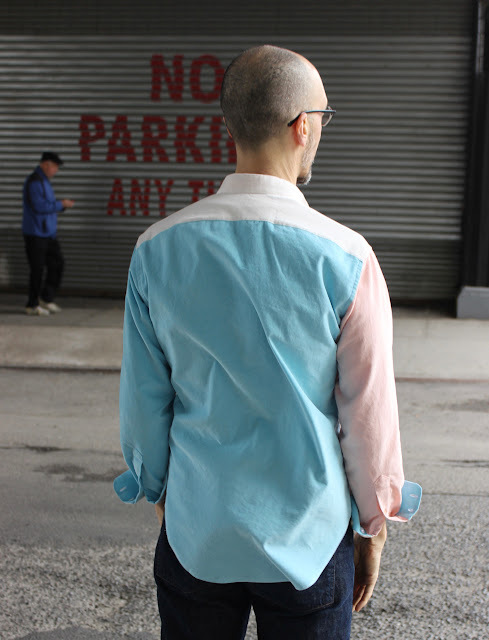 I didn't think I would like the pastels, but on you it all resonates. Another great MPB . I might go to that website and look at their fabrics but I prefer a heftier corduroy. I have a garment made out of a thicker almost velvet like corduroy that I hope to wear for a long time at dressier get togethers. Love it, especially the softer color palette. I hope you get lots of use out of it this winter (when it decides to get here!). Peter this shirt really is the business. What a great piece of design! It's nice, but a bit too predictable. I think the right cuff should be white. And I'd add a white patch pocket on the right side (white on white). Like! Glad you left off the pocket; yours is more streamlined and modern though I too kind of wish you had done the cuffs in different colors. You look great in a banded collar. Have you considered making a scarf out of the red? It would look great with a black jacket. That is just so nice. It looks fantastic on you - definitely your colors! you are so cute and so is your shirt: thanks for sharing. i appreciate the evolution of your sewing/tailoring venture and you have given me inspiration. i'm sitting with my (one) dog and 90+ husband, thinking of you, Michael, doggies and Mom. Happy Holidays and, thank you. Hey man this looks so blessed. Where did you get the pattern?